March 24, 2010 Dan O.
I don’t care what you people say, I FREAKIN’ LOVE THIS MOVIE!!! 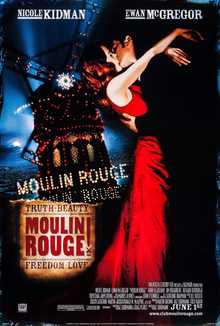 Satine (Nicole Kidman), the star of the Moulin Rouge and the city’s most famous courtesan, is caught between the love of a young writer and another man’s obsession. Christian (Ewan McGregor) is a writer who finds himself plunged into this decadent world where anything goes – except falling in love. When it comes to some of the greatest musicals of all-time, I think this would have a nice spot on my list. I love this movie just because of how it is, without being anything else. Director Baz Luhrmann is the real star of this movie because he doesn’t follow all these other musicals that are known. He uses licensed songs such as “Like A Virgin”, “Heroes”, and “Your Song”. The film isn’t afraid to be silly when it needs to but its not all the fun that gets this film really at me, its more about the true story of love. The film is so original with everything it does, because it doesn’t play by the same rules all other musicals do, it basically is laying down the ground that this is what film should be: fun. It has a plot from 1400s operas, look from 1950s broadway productions, and it has a visual style from current music videos. The film obviously takes some notes from Romeo & Juliet (Luhrmann directed that back in 1996), because this is also about forbidden love, but is also about the joys and also the tragic heart-breaks that love can effect you with. I have to mostly credit the way this film looks cause this world that they live in, is very unrealistic, but it seems all too much fun. I actually wanted to go there and live in this place as this film was going on. The set designs look so lavish, with all the beautiful colors and costumes coming right at you, bringing this whole world of fun, love, and heart break to glorious life. The songs are what makes this film great, because as I mentioned before, its licensed songs. The songs that they choose for these particular moments in the film, work so well, and actually seem like they could be real songs that these people were actually singing. They combine a lot of different variety of music, like “Smells Like Teen Spirit” and “Roxanne” but most of it all works so well here. The performances from this whole cast are just stunning, cause not only is it their real acting that’s good, but all of them can basically sing. McGregor plays his lead character with so much charm, but yet so much unknowings about love, and thats why it makes him a great protagonist to cheer for. The real show here is Kidman who is just a total knock-out with her performance. She plays this character with so much beauty, charisma, and also tragedy without once hamming it up for the camera. The way the two interact with each other on-screen seems so real and genuine that its hard not to want these two together in the end. If anything the only problem I had with this film was that its main villain played by Richard Roxburgh seemed too cartoonish at points, and I couldn’t take him seriously as a bad guy. Consensus: Moulin Rouge! is a musical that is fun, energetic, and so original with an inspired direction from Luhrmann, beautiful performances from McGregor and Kidman, and great look, feel, and sound that its hard not to love this film and hail it as one f the all-time best. Not going to be able to agree with you on this one. I find there is very few in between on this movie. I was just momentously underwhelmed and it ended up on my Top Ten Overrated Films list. It was okay, but certainly not as much praise as it receives. Just my end of the stick! Good review of the movie that relaunched musicals in Hollywood. I have an unrelated comment though, I think your blog might be better served not to have all your posts on the main page. It makes navigation nearly impossible, load time is quite long and slower computers may have trouble accessing your page. Yeah I know what you mean, I’ve actually started to lessen down the reviews on pages just for that reason. Days turned into weeks, weeks turned into months. And then, one not-so-very special day, I went to my typewriter, I sat down, and I wrote our story. A story about a time, a story about a place, a story about the people. But above all things, a story about love. A love that will live forever. The End. I like that narration a lot, it’s just hopeless romantic stuff that I find irresistible. I adore this movie, it’s one of my top 25 movies of the decade (http://wp.me/pxXPC-Cj) McGregor plays such a charming romantic lead and oh, and what a voice! I think the music is definitely one of the strongest element in the movie. Ewan & Nicole have such great chemistry together, too, which helps us believe in their love story. This is definitely one of Baz’s finest work! Absolutely one of my favs…and not just because it incorporates a Queen song (obsessive Queen fan here). It was like a mix tape I made back in the day. Great songs used in order to form a story with such wonderful visuals. McGregor’s innocent turn was wonderful and Jim Broadbent always shines. I love this and is totally one of my favorites too. I actually watched it a couple of days ago and really fall more in ove with it each time I watch it. Using already recognisable songs is such a brilliant idea and works so well. Especially with “Come What May” being the only new song in the film. This is my favorite movie of all time and I thought your review of it was perfect. Your reasoning’s behind why it is such a good film and the style of it do justice to the movie. I agree with you all the way.